Nasal congestion is the blockage of the nasal passages, also known as nasal blockage, nasal obstruction, blocked nose, stuffy nose, or stuffed up nose. Nasal congestion is usually due to swollen nasal membranes from inflammation of blood vessels. Sinusitis is any condition of inflammation in the sinuses connected to the nasal cavity. A simple runny nose is defined by unusually large amounts of nasal fluids with or without inflammation and blocked nasal breathing. Catarrh is a runny nose with thick mucus and white blood cells in response to an infection. Snot and Boogers are the slang term for congealed nasal mucus as it dries. Sore throat – Infection, or mouth breathing causing dryness both irritate the throat. Bad breath – Ama & putrefaction cause bad breath. Fatigue or irritability – More prominent in chronic sinusitis. Nausea – Mucus resists digestion by stomach acids. Swallowing mucus weakens digestion. Fever – Typically associated with acute sinusitis. Sinusitis lasting more than eight weeks or keeps coming back is considered chronic. Fever is more common in acute sinusitis. Chronic sinusitis often causes more significant fatigue. 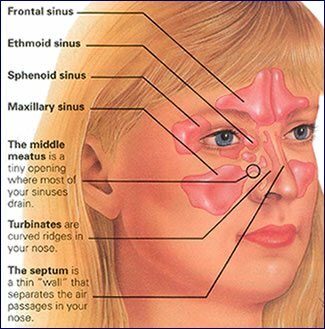 There are four pairs of sinuses in the head. The location of the pain can indicate where the infection is more prominent. Sinusitis usually follows a viral infection of the upper respiratory tract. The viruses damage the cells lining the sinuses, causing inflammation, swelling, and buildup of fluids that obstruct the nasal passages. The obstruction disrupts elimination of bacteria normally present in the sinus cavity. The bacteria multiply and invade the sinuses causing thick yellowish or greenish exudate. Allergens, pollutants, dryness, and chronic acid reflux create a similar effect, damaging the lining of the sinuses. Streptococcuspneumoniae, Haemophilus influenzae, and Moraxella catarrhalis are normally involved in acute sinusitis. Staphylococcus aureus and anaerobes are sometimes involved in chronic sinusitis. Fungi is an increasing cause of chronic sinusitis, especially in people with compromised immunity, such as with AIDS, leukemia, and diabetes. Soups are traditional dietary foods for common cold and sinusitis. The warm broth of a vegetable or chicken soup warms the blood and entire body. Kapha people often get stuffy noses in the spring when the blood is naturally rich. If heavy, rich foods have triggered a flood of mucus, a day of light fasting helps clear mucus and dry out the blood. Keep the head and chest warm with a hat and plenty of layers. Sweets and dairy should be avoided including cheese, yogurt, & milk because these provoke mucus (Kapha). Avoid cold water and swallowing mucus. Cilantro and an Ayurvedic herb called guduci are hypoallergenic. Mouth breathing and suppressed appetite causes significant dryness irritating nasal passages. Take care to prevent dehydration. Vata may employ daily oil massage except where fever is present to balance dryness and keep the skin warm. After the acute infection has resolved, five drops of ghee, sesame oil, or nasya oil (medicated nasal oil) in each nostril daily will help the sinuses heal and restore the senses of taste and smell. Foods that are difficult to digest should be avoided. Cleanse the colon with gentle laxatives such as triphala and enema therapy. Proper drainage of the sinus passages will help the bacterial infection to resolve. Since all infection involves pitta dosha and inflammation, avoid substances that clear the sinuses by further irritating them. Humidifiers make the air warm and moist, soothing the lungs and nasal passages. Inhaling steam infused with ginger or a few drops of eucalyptus oil can open up the nasal passages. Avoid dry heat. Hot baths move circulation. Heat up the room beforehand to avoid a chill when finished bathing. Vibrations from humming can help phelgm to drain. Keep the head upright to help the sinuses drain. Dry throat and lung irritation from mouth breathing can be alleviated using lemon, ginger, black pepper, honey & salty tea. Sour, salty, and sweet tastes are secretagogues, encouraging fluid secretions. Fluid secretion in the sinuses thins mucus for easy removal and also coats dry membranes. Pungents like ginger, black pepper and cinnamon break up mucus and assist expectoration. Demulcents like wild cherry bark, licorice root, and marshmallow root also assist expectoration. Sip or gargle teas made from these ingredients. For sore throats try Honey, Turmeric, Ginger, & Black Pepper Tea. Clear the nasal passages by inhaling the vapors from crushed raw onions. Just as chopping raw onions make the eyes watery, sniffing them liquefies mucus. Raw onions are also a fast acting anti-inflammatory that reduces swelling in the nasal passages when appropriate. Simply crush a 1/4″ thick slice of onion in a mortar and pestle and inhale the vapors until clear. Once the nasal passages have been cleared with crushed onions, rinse them with a saline solution of 1/8tsp salt to 1c water. Use a neti pot if you have one.